Till then, all best and happy reading. I've enjoyed the Against books and can't wait to read "Against the Night." It sounds really good, doesn't it, Jane? 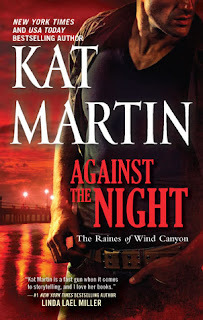 Hi Kat, Thanks for the terrific guest blog; I look forward to reading AGAINST THE NIGHT. I also love to travel. My latest trip was in January when my husband and son planned a dream trip to Bellevue, Washington to meet five of my favorite authors: Eloisa James, Julia Quinn, Connie Brockway, Christina Dodd and Lisa Kleypas! It was a dream come true for me and was made even more exciting when PJ asked me to do a guest blog here on TRD. We all enjoyed the trip right along with you, Flora! We were military so we got to do a lot of traveling, at least in the U.S. Did a lot of sightseeing on each tour. Kids got a great view of just how beautiful and different each state is. Love the Against series. TrishJ, there are so many wonderful sites to visit here in the U.S. Do you have a favorite area? It's fabulous that you can use your love of travel & places you have visited in your writing. Hi, Kat! Welcome back and congrats on your new release! I enjoy traveling and have been to much of the US, but never out of the country. This summer, though, my family and I will be taking a cruise and one of the places we will stop is Belize. I'll make sure NOT to order the capybara. LOL! Most of the Kat MArtin books I have read are the historicals. I have been following the release of the AGAINST books and look forward to reading them all. I have always wanted to travel and have done as much as I could. I was in the Peace Corps and got to see a bit of South East Asia. I married a military man, but we only had assignments in the US - with 7 years in my home town. That was not the way it was supposed to work out. We took advantage of every assignment we had, seeing as much of the country as we could. It was a great experience for the children. Since retiring from the AF, we have traveled whenever we could. We are looking forward to our "real" retirement so we can do some serious traveling. If I just make it to Ireland, Scotland, and England I'll be happy. Thanks for an interesting post and thanks for the great books you write. Hi Kat, Love your books and already have "Against the Night" and "Against the Sun" on my wish list. I have already read "Against the Fire, "Against the Storm and "Against the Wind" plus others and really looking forward to reading both Against the Night and Against the Sun when released. I love to travel but have not done so in 2 yrs. Do hope 2012 will be a traveling yr for me. There are so many states I have not had an opportunity to visit.